Fish are water living vertebrates. They use their special organ called gills for breathing. There are in total more than 30,000 different species of fishes that live in ocean and other freshwater bodies. A few of them are dangerous to humans. The world’s most dangerous fish are listed below. Electric Eel: – It is a South American fish that stun its prey by producing a powerful electric shock. Electric eels are long, cylindrical and generally gray-brown in color. The electric eel can reach up to 9 feet long and can weigh up to 22 kg. These fish have a sensitive mouth rich in blood vessels that can be used as lungs. The tail region contains the electric organ and that discharges 300-650 volts of electricity. Atlantic Manta: – This is the largest species of the Manta Rays and can grow up to 23 feet in width. They are also known as giant devil ray. Atlantic Mantas are generally found near the surface of the ocean. They prefer to stay closer to shore in the warmer waters because food sources are in abundance. Stonefish: – These venomous fish are generally found in shallow waters of the tropical Indo-Pacific. These fish have small eyes and large heads and mouths. If you ever see one stay well away from it. Piranha: – There are more than 60 species of Piranha fish. These carnivorous fish have razor sharp triangular teeth. Most of Piranha species are scavengers or feed on plants. Tigerfish: – These fierce predator fish have sharp spines on its gill covers. There are a total five species of Tigerfish. H Goliath is the largest and H Vittatus is the smallest out of five. Moray Eel: – There are over 80 species of Moray Eels. They can be found in all tropical and subtropical seas. These fish have small rounded gill openings and do not have pectoral fins. It makes them distinguishable from other eels. Great White Shark: – These powerful fish are also known as white pointer. Great Whites have been around more than 15 million years. This shark is renowned for attacking humans. Candiru: – It is a scaleless parasitic catfish that is found in the Amazon River region. These fish are generally found in the gill cavities of other fish. Sometimes it also attacks humans. Red Lionfish: – The Red Lionfish have venomous fin spines that can cause painful wounds to their prey. They are native to the South Pacific reef ecosystems. Puffer Fish: – Puffer fish is also known as swellfish or blowfish. They can inflate themselves with water and air to turn into a virtual ball several times their real size. One puffer fish has enough toxins to kill about 30 humans. 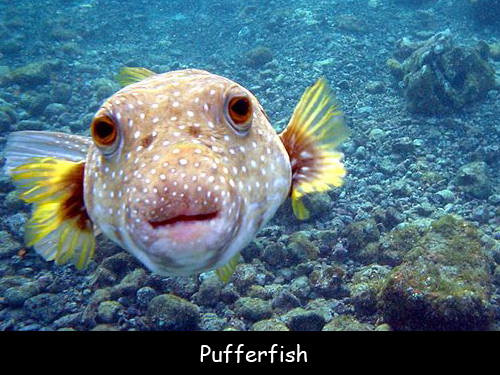 There are total 120 species of puffer fish all over the world. Declan, Tobin. " World's Most Dangerous Fish Facts for Kids ." Easy Science for Kids, Apr 2019. Web. 24 Apr 2019. < https://easyscienceforkids.com/worlds-most-dangerous-fishes/ >.